Thank you for sharing. I have been wanting to get some starter going again. I make bread for my family weekly. The Middle Man just asked me for sourdough! I will get some starter going for this recipe today. I can't wait to try it. I love the pot cooking! I normally bake on stones, but I do have a couple of smaller pots I could use. I'm sure it has to do with the immediate heat of the sides that you get that beautiful crust. No steaming? LOVE IT! I'm roofing a hay shed today, I needed this! Oh yay! So happy to hear it worked for you, Liz. 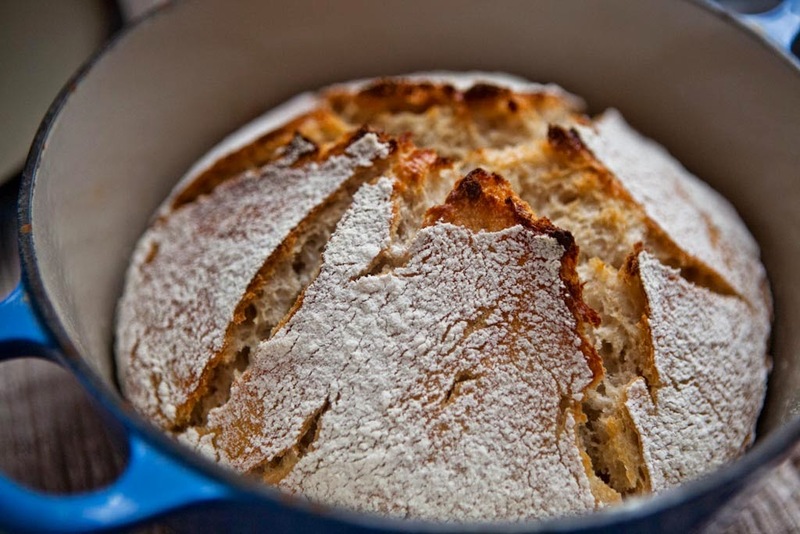 We need to get back on our sourdough routine. Our started perished and we've just been slacking with no bread around the house for months now! That round looks so tasty though I must encourage Matt (our master baker) to pick it up again. Or, heck, perhaps I shall have to take matters into my own hands! Thanks for sharing the recipe. Hope you and/or Matt give it a try! No homemade bread for months is a tragedy! 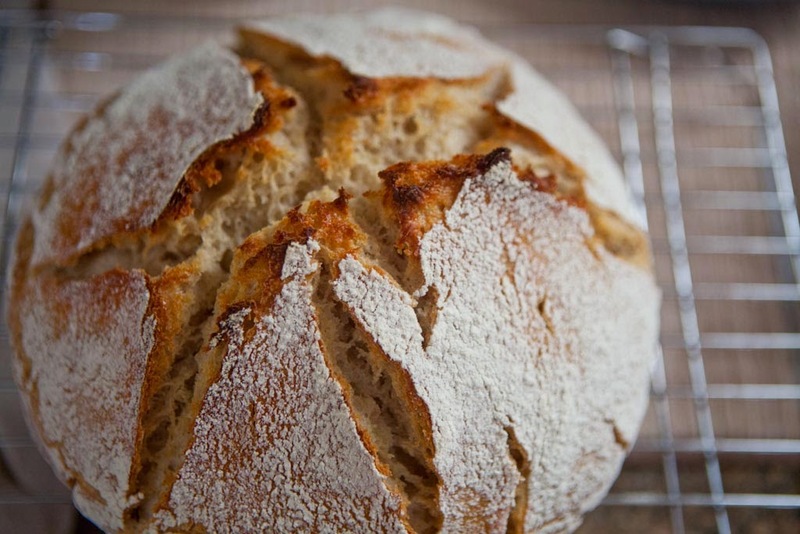 I feel I ought to send you a loaf ;) Or I wonder if sourdough starter can travel by mail?? It took hardly a prompt from me. He started a new batch of starter. Its bubbling away. The end is in sight for the bread drought! Huzzah! It was interesting though in that we just didn't eat bread, really. We didn't go back to buying bread. We just didn't have it. Weird. But, I guess that is a good thing. The bread drought has us properly motivated again. This no kneed recipe looks like just the thing for me to be able to do with two kids hanging off my legs. I might just have to try this at some point. Thanks! Jaime, I tried it and the flavour/crust were FABULOUS! The texture is divine and it's dead easy to make. Mine didn't end up as pretty as yours, but we sure loved it - we demolished half a loaf in 10 minutes! Hooray! So glad it worked for you, and thanks for letting me know. We tear through half a loaf, too, once it's cool enough to handle ;) If you have any day-old extra, it makes for great croutons as well! Wow, that looks awesome! Someday I'll give sourdough a whirl! Jaime, it's beautiful! And beautifully simple. I must try this recipe. Sourdough has been on my mind lately but I don't have any starter at the ready. Adding to my must-do list immediately! Sounds so simple and looks so delicious. Do you have a starter recipe or link that you could share, I've seen lots of recipes but I tried and tested one would be great!! -I started with about a cup of small organic grapes (picked off the stems), mashed up a bit to let some of the juices out. -I added the grapes to a bowl in which I had mixed 1 Cup of water and 1 Cup of spelt flour (or you can use unbleached white flour). -In a few days, a crust develops on top of the bowl. At this point you can remove that and strain the starter into jars. -cover the jars with muslin or a handkerchief and continue to feed the starter. Once you see it bubbling a lot and expanding, you should be able to use it for baking. -in the long term, I cover the jars with a regular lid that I've nailed a hole into. And then it's just all about feeding it a couple times a day and enjoying baking with it! I hope that helps, and good luck with yours. Thanks for that, it’s the first time i’ve seen a recipe with grapes! ! Just made my first batch of fruit kefir - very exciting to see it fermenting away. Kindest regards from the french alpes. Thanks for the recipe! I've been trying to get my sough dough started. I've used it for a few things and now believe I'll try it out on this.